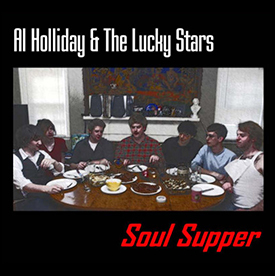 The Al Holliday story – and Discography – is not complete without Al Holliday & The Lucky Stars 2010 release, Soul Supper. Active from 2007 until 2010, Al Holliday & The Lucky Stars was formed in Columbia, MO by young-blood rapscallions studying at The University of Missouri. The band was active in the very happenin’ Mid-MO music scene back-in-the-day, along with acts such as Z.A.P., The Collegiate Shag Brass Band, The Getdown Underground, Reelfoot, and Moonrunner. The band’s rhythm section, Ian Beiersdorf (Guitar/Vocals), Rock Gremillion (Bass/Vocals), Neil Ghanti (Drums), and Al Holliday all lived together down at 108 E. Hubbell between downtown and the urban farm with Joni the Dog. The full band, including every Lucky Stars member – Elliott Williams (T. Sax), Alex Williams (Tpt. ), and Nick Simone (A. Sax) – is photographed on the cover of the album eating a delicious Soul Supper of pork steaks, green beans, and fried potatoes. Soul Supper was recorded live in the studio over 3 days in February 2010 by Wil Reeves at Centro Cellar Studios. The album features five original numbers by the band, “The Mississippi”, a tribute to our regional community and some of the best people of all – river people, “My Name Is Al”, a fan favorite from our live shows, and “Go, Baby, Go”, written and sung by Mr. Ian Beiersdorf himself, plus two instrumentals: the groovin’ “Loyd’s Boogie” and the minor key instrumental blues with changes, “Mo’ Foolin'”. Soul Supper also features a King Curtis-inspired rendition of Herbie Hancock’s “Watermelon Man”, and a special version of Pee Wee Ellis’ “The Chicken” with Jaco Pastorious’ “Soul Intro” on top. While very few copies are still available in print, Soul Supper is still enjoyed by many fans and friends of the band. Musically, Soul Supper stands on it’s own and lives to tell the story of Al Holliday & The Lucky Stars and the Columbia, MO days with the band. A tremendous influence on Al Holliday & The Lucky Stars was the one and only “Doc”, Dr. Doug Leibinger, Director of Jazz Studies at M.U. Doc worked a lot with Al and took the band in as a Jazz Combo to work with them on their own variety of Soulful, Funky, R&B music. Fatefully, Doc taught Al, along with many others, how to write charts and arrangements for big bands and ensembles. You can still hear this influence in the East Side Rhythm Band to this day – along with several other working bands. Doc is currently livin’ it up and teaching in California at Sonoma State University, bringing a serious education to the good people there, and raising up his beautiful family. Big time thanks to Doc for all of his work with Al and the band. Another greatly influential person from the Columbia, MO days is Mr. Loyd Warden – truly a Soulful R&B guru. Loyd’s professional R&B credentials include performing as a drummer with big name performers like Buddy Guy, Ann Peebles, and Johnny “Guitar” Watson. Among all kinds of things, he laid some heavy tricks on us – told us about bringing it to the Mountain Top, getting your picture with the bear – always encouraging us young-bloods to keep on doin’ our thing. Loyd is still a big-time supporter in our careers and in our lives. He teaches professionally and runs a boutique studio at the A-Frame in Columbia, where he is raisin’ up the next generation of a beautiful family as well as the next generation of high quality musicians from Mid-MO. Most influential were all the good people from the Columbia, MO days. They say Art is how we decorate space and Music – is how we decorate time. Well, then – the band’s time with the good people in Mid-MO is the most decorated kind.